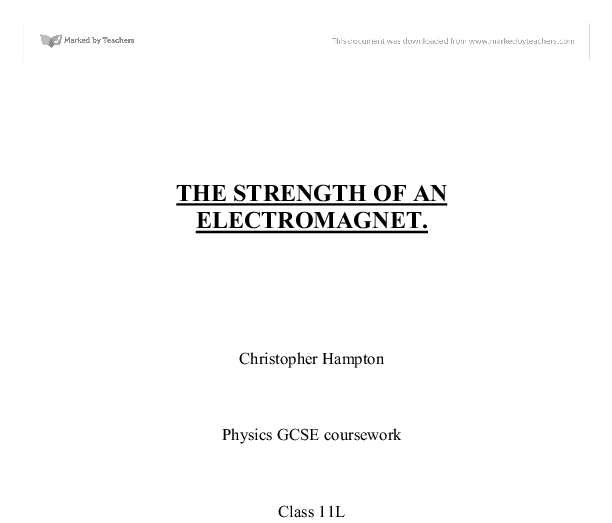 The object of this project is to plan and carry out a simple, fair, controlled and safe experiment to determine the factors that control the strength of an electromagnet. I know from previous years work that the strength of an electromagnet is determined by the number of coils of wire used, by the amount of current fed through the wires and that by putting a piece of iron or steel in the middle of the coil that the strength is increased. In this project I will investigate the pattern by which changing the amount of current flowing through the coil will change the strength of the electromagnet. I will need to make the experiment fair, simple, reproducible and safe. I will use the ability of an electromagnet to pick up a metal object as the measure of its strength. A panel pin is a small nail that is made of metal and so will be attracted to a magnet. 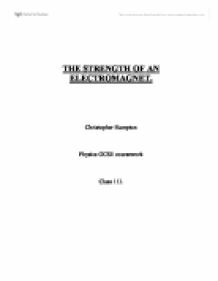 The number of panel pins the electromagnet could lift is therefore a measure of magnetic strength and as panel pins are small it would be better to weigh the amount lifted, although it would also be possible to count the number lifted. The experiment could be improved by taking more readings at each point. This would increase the accuracy of the average readings. Also you could use a new set of panel pins for each experiment so that they do not get magnetized and so give a slight over-reading. It would also be possible to completely demagnetize the iron core between each experiment, because although the residual magnetism is less with iron than steel, there is still some residual effect that will carry over from one reading to the next. The temperature control was not prefect. The magnet and coil tended to warm up when the power was on and then cool down when it was turned off. It would have been better if the temperature was constant throughout. Finally you could use a different type of weight such as iron filings, to prevent dropping of the pins before weighing them. Iron filings weigh less per individual piece so may give a more accurate result, although they are difficult to use because they are so light and may be worse. Another preliminary experiment would answer this question. Varying the number of coils, while keeping the current the same, could extend the experiment. Also the relationship could be tested at greater currents to see if the relationship hold true as the power is increased. Finally you could keep the current and number of coils the same and vary the size of the iron core. In this case of this experiment the change in output is the change in voltage and the change in input is the degree interval. We can then use this information to see if the sensitivity of the of the rotary potentiometer changes as the degrees increases. Next I took my reading of the potential difference across the thermistor. I suspect that if I had to correct the potential difference of the lab pack, the temperature of the water could have dropped by roughly about 1°C by the time I came to read the potential difference across the thermistor. Looking back on the final experiment we did, the crocodile clips were not as accurate as they could have been in measuring precisely the distances. Also, I don't think that we left the wires for 30seconds between each reading due to time restrictions. The reading of the light-beam galvanometer was recorded. Current (I) = 2.4A 23. The time taken for the complete removal of the small solenoid from the large solenoid was measured and recorded by a stop watch. The procedures were repeated 4 times and the mean time was taken. Extrinsic semiconductors are made from intrinsic semiconductors. Adding tiny amounts of another substance makes them extrinsic. The amounts added are very little so that the added atoms are well spaced from each other. This is so that the structure remains the same even if the property changes. So therefore expression 3 becomes: R = ? ? l A (Expression 4) This equation rearranged will them become ? = R ? l A (Expression 5) Points to note: My final graph will have a positive correlation. This is because the formula ? = R ? l corresponds to the formula y = mx + c.